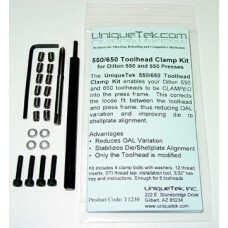 Enables Dillon 550 and 650 toolheads, and RCBS Pro 2000/Piggyback -3 & -4 dieplates to be CLAMPED into the press frame. This eliminates the loose fit between the toolhead and press frame, thus reducing OAL variation and improving die to shellplate alignment. 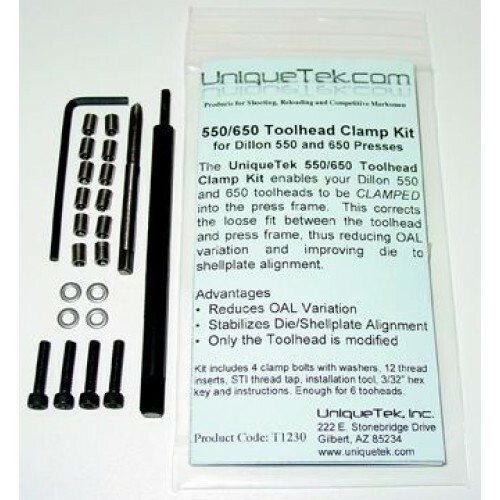 Kit includes 4 clamp bolts with washers, 12 thread inserts, 9/64" drill bit, STI thread tap, installation tool 3/32" hex key and instructions. Contains enough parts for 6 toolheads and up to 2 presses. Installation and use is quite simple. You tap threads into the two locator pin holes in the toolhead then install a stainless steel thread insert into each hole. The press frame is NOT modified. When you install the toolhead in the press frame, insert the clamp screws instead of locator pins to hold the toolhead into the frame. Leave the screws loose until you begin cycling the press and have all dies occupied by a round. Then, with the ram still in the up position, tighten the clamp screws. This procedure aligns the toohead to the shellplate, reducing jams. The clamp screws also create a preload force, clamping the toolhead against the top of the press frame, stopping the toolhead from moving during the press cycle and resulting in reduced OAL variation. Once the srews are tightened, just continue reloading as usual.